Did you know it’s 18 years since The Gruffalo was published?! 18 years of beautiful rhyming books that children can recite in not too long at all. Julia Dondalson’s books have quickly become children’s classics. With illustrations from Axel Scheffler and Lydia Monks the books are colourful and full of charm. Today we look at the sequel to ‘What the Ladybird Heard’ quite simply called ‘What the Ladybird Heard Next’. Published in September 2015, it’s new edition to the Julia Donaldson range. As with a number of Donaldson books this one is illustrated by Lydia Monks, her illustrations are colourful, glittery and fun. This book is aimed at children between 3-6 years old. 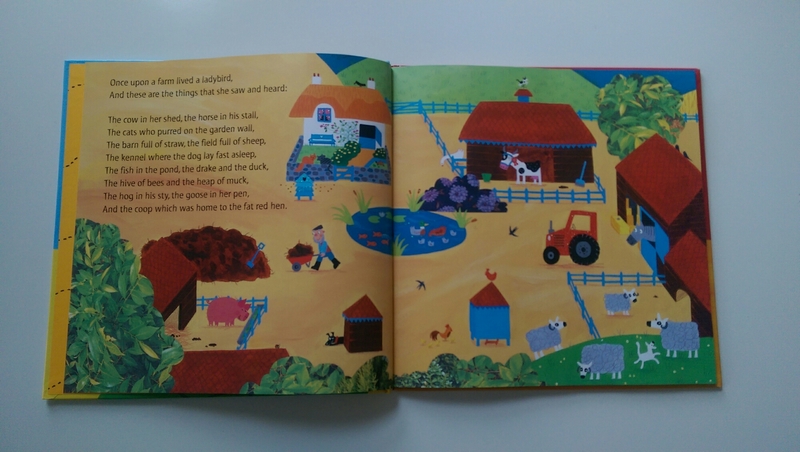 What the Ladybird Heard Next continues at the farm with a host of animals, just where the first book left off. The cunning plans of Hefty Hugh and Lanky Len feature once again. As does the wonderful rhyming that only Julia Donaldson can achieve. This is a fun sequel to the first book, and I think it will certainly make children giggle, as there’s rather a lot of ‘muck’ involved. Once again the quiet little ladybird is the one to save the day. The glittery textured pages will have children following the ladybirds trails, whilst the rhythm keeps children very interested. We have found the children we look after finishing the sentences of Julia Donaldson’s books, and also being able to recite them before the age of 3. Amazing. What are your favourite Julia Donaldson books to read with children? You can find out more about the Julia Donaldson books here.